We'll start with the time signature that you see most often in music - 4/4 time. (3/4 and 6/8 are also quite popular in Irish music, but we'll talk about these later). 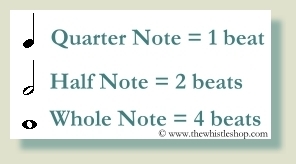 A time signature of 4/4 means: 4 beats to a measure, and a quarter note is one beat long. Lets take the top number in the time signature first. There are 4 beats in a measure. A measure is the space between two bar lines (the bar lines are the vertical lines that separate the notes). Click on the link below to hear a beat in 4/4 time. As it is playing, count "1, 2, 3, 4, 1, 2, 3, 4, 1, 2, 3, 4...". Every time you pass "4", you will have counted one measure. The lower number in the time signature tells you what value to put on the individual notes in the tune. In this case the 4 means a quarter note gets one beat. Look at the chart below for a list of note values that are covered in this lesson. Now it's time to put this all together and actually play something! We recommend that you listen to the sound clip first (just click on the image below). Count along with the music, following the beat as it's written out below the notes. You'll hear 4 beats of introduction before the tune actually starts. Now try playing along with it. As you play, "tongue" each note. You do this by whispering the word "too" as you play the note. The little x's and o's above the notes are the fingerings for each note. The x means that you cover the hole, the o means the hole should be open. Take a good breath - but don't over-fill your lungs - and try to play the whole phrase without taking another breath. Breathing is a very important aspect of playing - try to take breaths at the end of phrases whenever possible, but don't wait so long that the notes sound "forced" (this will come more naturally in time). Don't forget to count along while you're playing. When you feel comfortable playing this, it's time to move on to Lesson 3!